how to view the latest posts, registering problems, change the type size.... etc. 1. 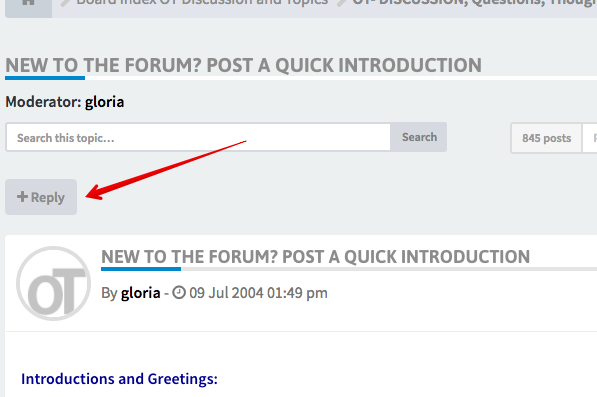 Look for the button labeled "Post Reply" on the discussion page (‪New to the forum? post a quick introduction, click on this link). 2. You can just say hello, and if possible mention how long it has been since you were diagnosed. And, how long you have had symptoms of OT. If you have not been diagnosed at this point, you can still say hello and discuss your thoughts and OT. 3. Where were you diagnosed? 4. If you know how your doctor diagnosed you as having OT, for example… your doctor used an EMG, or stethoscope etc., please post this too. "OT- DISCUSSION, Questions, Thoughts and Advice" or "OT- "THINGS" that help". When you are inside of a category you will see a button labeled "NEWTOPIC", click on this button to discuss something new. We're very glad that you have joined the OT community. IMPORTANT: This website contains general information about medical conditions and treatments. Much of this information is from members similar to yourself. What works for one person may not be appropriate for another, therefore, the information is not advice, and should not be treated as such. ALWAYS consult with a medical professional before making any decisions about treatments etc.